In the fast-paced world of broadcast production, large-scale broadcast facilities that “break out” of the black box of the traditional studio to leverage dynamic, flowing spaces open up a whole new realm of on-air branding as well as enhanced collaboration and workflows — a strategy that is serving Al Jazeera Media Network well. 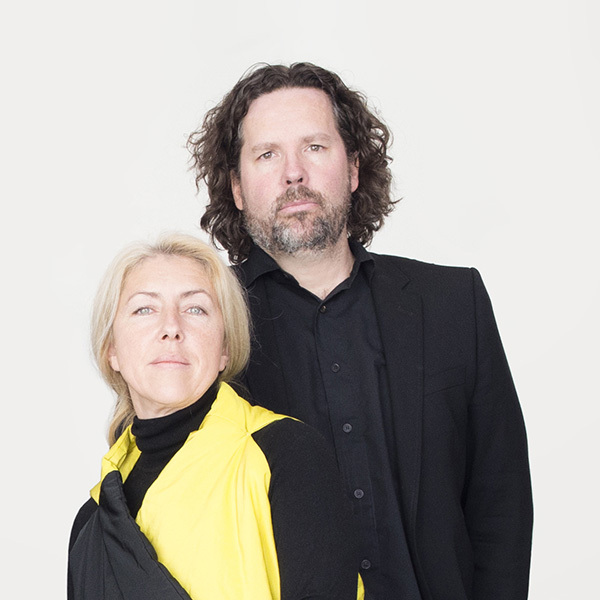 Veech x Veech is a Vienna-based, interdisciplinary architecture and design firm founded by Mascha Veech-Kosmatschof and Stuart A. Veech. As a leader in linking media and architecture in innovative ways to create new forms of spatial communication, Veech x Veech has 25 years of expertise and this approach is uniquely situated to serve the needs of national and international broadcasters looking for unconventional broadcast facilities and environments that go above and beyond the traditional creative brief. Working with a network of national and international specialists and partners, Veech x Veech uses cutting-edge, collaborative and participative methods with all their clients and consultants to drive innovation and create high-quality, cost-controlled international projects on various scales, ranging from entire buildings and studio environments to design functional workspaces and interiors, exhibition-, event- and art installations, all of which provide inspiration and background for the firm’s innovative creations. Al Jazeera’s London newsroom in The Shard. Photos courtesy of Veech x Veech / Hufton + Crow. Veech x Veech’s experience also allows it to bring its trademark flair for finding unique and out-of-the-box thinking to existing facilities and studio environments. Projects can include everything from the firm’s unique approach on modern set design to state-of-the-art video walls and augmented architecture integration, to custom newsroom workspace and furniture design with an emphasis on increasing collaboration and communication while creating and distributing powerful content in a variety of formats. Veech x Veech’s work reflects fluid forms and shapes that gives every client a decidedly unique and timeless look — a key requirement for national or multinational networks that need to stand out in a crowded media landscape. Al Jazeera Network Studio Building – Doha. This design process draws on both founders’ extensive background in numerous facets of design — as well as a multilayered research process that takes cultural motifs, branding elements, client goals, competitor research and other factors into account when creating each brand’s look and feel. Ultimately, the result of this meticulous research is the creation and selection of core thematic elements that become the centerpiece of the final facility and studio designs. The final designs incorporate these aspects in a variety of creative interpretations, making it possible for a single brand to have multiple distinct looks that are still tied together thanks to Veech x Veech’s emphasis on cohesion in design. As broadcasting becomes increasingly multiplatform, Veech underscores that large-scale broadcast facility projects also must account for the blurring of the line between workplace interiors and broadcast environments, a move that emphasizes the importance of synergy between information flow, newsgathering and architectural elements. For Al Jazeera Media Network, which reaches 310 million households in more than 100 countries, Veech x Veech worked with the network in a 6-year collaborative process to create functional and flexible broadcasting and content-gathering spaces at multiple locations across the globe, redefining the network’s architectural and on-air identity on a global scale. “Al Jazeera’s re-envisioning of its look and feel was a massive undertaking that required long-term project management and vision coupled with our team’s choreographed efficiency across numerous disciplines,” said Veech. The end result was three major projects — an expansion of the network’s headquarters building and Al Jazeera Arabic newsroom studio in Doha, Qatar as well as a newsroom facility inside the iconic Shard Tower building in London — all of which incorporate a cohesive look that bolsters the network’s functionality as a global media player. In Doha, Veech x Veech not only created the trendsetting but timeless network building design, but also the 360-degree studio sets, carefully crafting interplay between the two. Al Jazeera Network Studio Building – Doha. Photos courtesy of Veech x Veech / Hufton + Crow. The Al Jazeera Arabic Newsroom project aimed to create open, free-flowing spaces that eschewed the traditional, restrictive black-box studios. The result is a new immersive multimedia environment — focussed carefully analysis on how physical workspaces affect productivity, workflow and fluidity. Opening up the network’s headquarters studio by framing the view to the external Doha campus and, thousands of miles away, the network’s U.K. newsroom, studio and workplaces capture London’s iconic skyline, Al Jazeera benefits from dynamic studio and workspace environments with exterior views — while the natural light and exterior views also create a more people-centric work environment. Of course, the use of exterior views and broad expanses of glass presented architectural, engineering and technical challenges, including the need to mediate between the changing climatic conditions and outdoor light levels. Veech x Veech’s team worked closely with high qualified, national and international partners and specialists to offer Al Jazeera a fully engineered experience that included envisioning, scoping, sourcing, designing, prototyping, testing and installing a variety of solutions for light control, augmented reality, video walls and the need for open, collaborative workspaces. 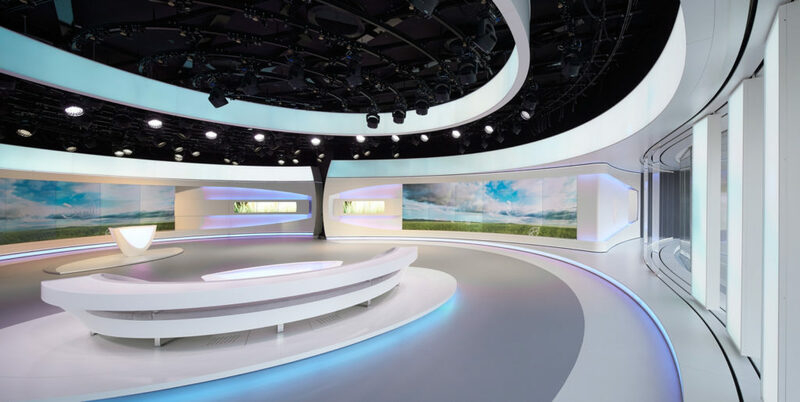 The design strategy developed for Al Jazeera put a key focus on implementing augmented architectural environments tightly integrated with “real life” spaces, resulting in specialized, hybrid architectural solutions. 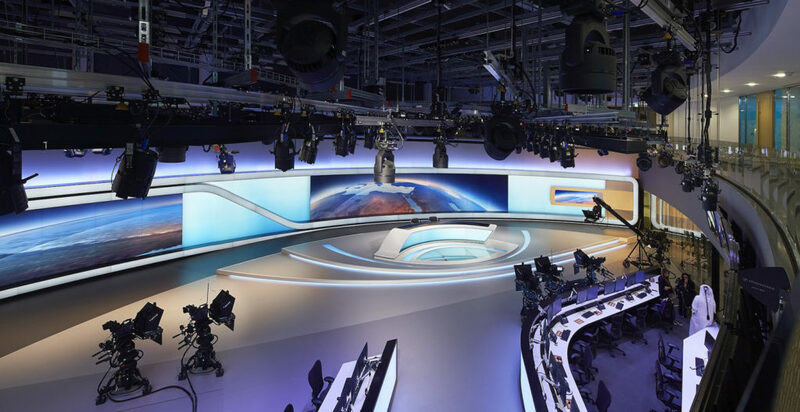 Al Jazeera Network Network Studio – Doha. Broadcast facility and environment projects are notoriously complex and multifaceted, so concentrating on custom-tailored, one-source fulfillment means avoiding superfluous interference, overlapping communication and — last but not least — avoidable costs, explained Veech. Consolidating innovative, interdisciplinary approach, technical know-how and diverse broadcast experience with universal design approach guarantees a cost-controlled, cutting-edge result. And, while streamlining offers a key advantage to any large-scale broadcast facility or studio project, the team at Veech x Veech, which has spent decades working in design industry, point to their passion for design as the ultimate strength they and their team bring to any client. Al Jazeera Arabic Newsroom – Doha. Summing up the challenging Al-Jazeera project, Stuart A. Veech says: “Through our collaboration with Al Jazeera, it’s possible to pinpoint how every element of our unique background in design and architecture shines through,” said Veech. For more information about Veech x Veech, visit their website today and make sure to follow the studio on Facebook and Instagram. Veech x Veech is a Vienna-based, award-winning multidisciplinary architecture and design practice integrating broadcast studio design, architectural & interior design, and design engineering services into one comprehensive package. Pioneers infusing architecture and advanced media technologies, Veech x Veech distinguishes itself internationally with pre-eminent broadcast buildings and production facilities, augmented media environments, multi-purpose newsrooms, and iconic studio designs establishing new benchmarks for the broadcast design industry.